(Centennial, Colo.) – GolfTEC – the world leader in golf lessons and largest employer of PGA Professionals – announces special holiday packages for golfers and gift givers, allowing players to experience the company’s famed Swing Evaluations, Lesson Packs and practice sessions at a great value. Swing Evaluations include video analysis, motion measurement, a fact-based diagnosis and a lesson plan to follow. During these 60-minute sessions GolfTEC’s Certified Personal Coaches use the company’s patented g-SWING technology to quantify each student’s swing and compare it to Tour averages. This data is used to build a personalized Game Plan that will address the changes needed to help golfers of all skill levels achieve longer, straighter shots and lower scores. Highly efficient and boasting a 96 percent success rate, GolfTEC lessons are taught one-on-one by Certified Personal Coaches in private, mostly indoor bays that utilize proprietary teaching technology. Developing a comprehensive improvement plan for each student is the foundation of GolfTEC’s philosophy. Since 1995, GolfTEC has taught nearly 6 million lessons at almost 200 locations worldwide. Committed to strengthening the industry and hiring only the best staff, GolfTEC employs nearly 600 coaches, most of whom have taught thousands of lessons. Each goes through a rigorous multi-week certification at GolfTEC University, including continued advanced training to master the analysis of golf swing mechanics, the technology of the GolfTEC system and the most productive teaching techniques. • g-SWING teaching technology – This patented software program displays real-time video with motion measurement, while capturing body positions throughout the swing. Coaches use the information to diagnose, communicate and measure the changes that will lead to improvement. • TECfit – Using Foresight® launch monitors to capture critical performance data – ball flight, ball speed, clubhead speed, launch angle, sidespin and backspin – coaches cross-reference this information with the proprietary SwingLabs® database to help select ideal clubs for each student’s swing. They can then accurately illustrate changes in ball performance that result from club adjustments. To learn more about the GolfTEC, please visit http://www.golftec.com/holiday or call 877-446-5383. The world leader in golf lessons has a 96 percent success rate among its students. The more than 600 GolfTEC Certified Personal Coaches at nearly 200 centers worldwide, including nearly 80 within Golfsmith stores, have given nearly 6 million lessons since 1995. All lessons are based on the company’s “Five Factors:” Fact-Based Diagnosis, Sequential Lessons, Video-Based Practice, Advanced Retention Tools, and TECfit club fitting. GolfTEC Improvement Centers can be found in almost all major U.S. cities, Canada, Japan and Korea. Inaugural Dustin Johnson World Junior Golf Championship to be Played Feb. 13-15 in Myrtle Beach, S.C.
Myrtle Beach, S.C. — Founders Group International, the Dustin Johnson Golf School and Myrtle Beach Beach Golf Holiday announce the inaugural Dustin Johnson World Junior Golf Championship, a 54-hole tournament that will be played February 13-15 at TPC Myrtle Beach. The invitational event will feature a 90-player field comprised of elite-level boys and girls from across the globe. More information on the tournament, including eligibility criteria, is available at www.WorldJuniorGolfChampionship.com. With the support of Johnson, one of top 10 players in the world, the tournament will provide participants a PGA Tour-like experience, and the chance to test themselves against their peers from others part of America and the world. TPC Myrtle Beach, a former host of the Senior PGA Tour Championship, has been ranked among America’s 100 Greatest Public Courses and will provide a tour-level challenge and participant amenities. The February date, which takes advantage of Myrtle Beach’s sub-tropical climate, provides juniors a chance to jump-start their 2016 season on President’s Day weekend. Johnson’s involvement with the tournament reflects his long-time commitment to junior golf, particularly in South Carolina, where he grew into one of the world’s best players. Through the Dustin Johnson Foundation, which is headquartered in Myrtle Beach, Johnson has donated more than $250,000 to junior golf, sponsoring numerous events throughout the state and helping cover entry costs for kids who need financial assistance. TPC Myrtle Beach is owned and operated by Founders Group International, one of the game’s fastest emerging and most forward-thinking owner-operators. Myrtle Beach Golf Holiday is a non-profit trade association comprised of 79 championship golf courses and 99 golf package providers in the Myrtle Beach, South Carolina area. Founded in 1967, the organization continues to be the driving force behind the growth of the region’s thriving golf market. The originator of the “Stay and Play Package,” Golf Holiday provides non-biased information about accommodations and golf courses to assist golfers in making the most informed decisions when planning for their next vacation. Golf Holiday also hosts seven events and tournaments annually to help to foster continued growth of the game. In addition to hosting the Hootie & the Blowfish Monday After The Masters Celebrity Pro-Am Golf Tournament each spring, Golf Holiday also runs the Myrtle Beach World Amateur Handicap Championship – the world’s largest single-site amateur golf tournament, the Summer Family Golf Tournaments, the Palmetto High School Golf Championships, the Veterans Golf Classic, the Preseason Classic, the March Championship and the Myrtle Beach Fall Classic. For more information about MBGH, visit www.MyrtleBeachGolfHoliday.com. Founders Group International is the foremost golf course owner-operator company in the Southeast. Formed in 2014 through various purchases and the 2015 acquisition of National Golf Management, Founders Group International owns and operates 22 golf courses (423 holes) in and around Myrtle Beach, S.C., the world’s most popular golf destination. Founders Group International also has a division that does residential and retail development. And, it has partnered with one of the biggest travel agencies in China to bring golfers and wedding parties to Myrtle Beach, S.C. Founders Group International administers www.MBN.com, a leader in online tee time bookings, as well as package outlets Ambassador Golf and Myrtle Beach Golf Trips. With the help of Golf Insider’s 100 percent player-generated course ranking system, thousands of golfers plan and assemble their ideal golf itineraries through Founders Group International’s assets, including “top-100 caliber” courses Pawley’s Plantation Golf and Country Club, Grande Dunes Resort Club, TPC of Myrtle Beach, King’s North at Myrtle Beach National Golf Club, Pine Lakes Country Club and over 80 other Myrtle Beach area courses. (CHARLOTTESVILLE, Va.) – Keswick Hall and Golf Club – the acclaimed 600-acre luxury resort set in Virginia’s scenic Hunt Country – announces its new Pete Dye-design, Full Cry at Keswick Golf Club, has debuted at No. 47 in Golfweek’s prestigious “Best Resort Courses” list for 2016.It’s a rarity for a new course in its first year of operation to enter the top 50 of this coveted annual ranking. Full Cry joins esteemed courses like Pebble Beach Golf Links, Pacific Dunes, Harbour Town Golf Links, Ocean Course at Kiawah Island and Pinehurst No. 2 in the upper half of the 100 layouts selected. Full Cry – a hunting term describing the call of hounds that have found the scent and are in hot pursuit of their mark – is the destination’s signature amenity. Resting at the foot of the Blue Ridge Mountains, the superb layout traverses the rolling terrain below the elegant 48-room mansion inn perched on the property’s high ground. The Golfweek distinction is the second major honor Keswick Hall and Golf Club has garnered in less than a year. In Feb., the resort received the Forbes Five-Star Award for its exceptional level of luxury and service. Ideal to enjoy playing golf in the area Thomas Jefferson once described as the “Eden of the U.S.,” the Pete Dye Golf Package starts at $319 (Monday – Thurs.). It includes a one-night stay at Keswick Hall, one round on Full Cry (plus complimentary replay), and “Grab and Go” breakfast. Perfect for a couple’s getaway, a second golfer may be added for $75. For more information on Keswick Hall visit www.keswick.com or call 434.979.3440. Set in the historic hunt and wine country of central Virginia, Keswick Hall is a 600-acre boutique resort featuring 48 private guest rooms. The northern wing of the luxury resort hotel contains historic Villa Crawford, once the Italianesque private estate of the Robert Crawford family built in 1912. A full complement of amenities and activities are available to guests, including: golf, tennis, three swimming pools, croquet, nature trails, on-site vineyard, garden / historic tours, spa and fine dining. Off-site excursions include wine tasting, Presidential home visits, University of Virginia tours, clay shooting and more. The property is home to the historic Keswick Club, a members club introduced in 1948 when renowned architect Fred Findlay added its first nine holes of golf. The course expanded to18 holes in the mid-‘50s and was renovated in 1992 by Arnold Palmer. In 2013, World Golf Hall of Fame architect Pete Dye was commissioned to create its new Full Cry layout, named in Golf Digest’s prestigious “2015 Best New Courses” list. The country estate is a property of Richmond, Va.-based Riverstone Group under its Historic Hotels of Albemarle division. The company also owns and manages The Sanctuary at Kiawah Island Resort (S.C.), The Sea Pines Resort (S.C.), The Jefferson Hotel (Va.) and The Hermitage Hotel (Tenn.). Keswick Hall – centrally located — is an easy two-hour drive from the Washington D.C. metro area and just over three hours from Baltimore. Charlottesville Albemarle Airport (CHO) is 30 minutes away. Richmond International Airport (RIC) is a 60-minute drive. The South West of Ireland has long stood as a true golfer’s paradise. When the time comes to plan a pilgrimage to one of the world’s great golfing Meccas, award-winning Golfbreaks.com and its local experts save you time and money. Not to mention, the Irish may be the world’s most naturally gracious people, full of fun and entertainment — “craic” as they call it — and South West Ireland’s easy atmosphere can have a tonic effect on one’s game. Wherever you go, whether to a highly regarded private golf course, a family-run hotel, or an auto service station, visitors are made to feel welcome. And staying in central locales such as Cork or Killarney, with a driver and easy access to all top courses, simply cannot be topped. Imagine enjoying an itinerary that included legendary, highly ranked links like Ballybunion, Tralee, Lahinch, Waterville, Dingle and Dooks, with spectacular views, giant dunes and some of the world’s most incredible holes. With plenty of direct flights from the United States to Shannon — and all the courses within a couple of hours of there — it’s easy to see why this corner of the Emerald Isle is so popular. The golf travel experts at Golfbreaks.com are well versed in booking trips for South West Ireland golf and many of the world’s other finest destinations. Founded in 1998 just outside London, England in the shadow of Windsor Castle,Golfbreaks.com has arranged golf trips for more than 1.5 million British and Irish golfers, establishing a reputation for expert service and great value. This award-winning and highly respected company — a partner of both the European Tour and The PGA of Great Britain — is now helping American golfers take the stress out of arranging their golfing pilgrimage. That means taking care of everything from tee times and hotel rooms to flights and ground transportation … as well as offering the very best prices and packages to suit all budgets. It really doesn’t get much better than a golf vacation in the South West of Ireland, and when you crunch the numbers, booking with Golfbreaks.com is a no brainer versus self-packaging and other operators. Now, anyone booking a golf vacation to the United Kingdom and Ireland for themselves and at least three others will receive a free Callaway Big Bertha Driver. All participants need to do is inquire for the vacation by November 30th, 2015 by contacting one of Golfbreaks.com’s expert sales advisers via the phone or through the website (USA.Golfbreaks.om). If you then go on to book the trip to the UK or Ireland for four or more golfers, you will receive a free Callaway driver. Learn more about booking a South West Ireland golf trip, 2016 golf packages and the free Callaway Big Bertha Driver at (855) 699-5853 or USA.Golfbreaks.com. Golfbreaks.com (established in 1998) is a specialist golf travel company, with its headquarters in Windsor, UK, and offices also in Charleston, SC, and Copenhagen, Denmark. Its aim is to save golfers time and money, by providing a unique one-stop service that makes booking golf vacations as simple as possible. With an expert team that is passionate about golf and travel, the company is known for delivering outstanding service at unbeatable prices. Golfbreaks.com is an Official Partner of The PGA of Great Britain & Ireland, the European Tour and also GolfNow, the leading tee-time booking and golf course technology and services platform. Learn more at (855) 699-5853 orUSA.Golfbreaks.com. To ensure a pleasant walk round after round, the SPEED HYBRID also includes a removable leather inlay sole with ECCO Comfort Fibre System™. The leather/textile shoes feature ECCO HYDROMAX™, a proprietary treatment that provides outstanding, long-lasting water-repellency, and are available in three colorways. Like all ECCO golf shoes, the SPEED HYBRID is crafted at ECCO-owned factories using the Direct-injection Process. This bonds the upper and outsole unit, creating a one-piece shoe without the use of glue or stitching. Benefits include permanent memory and a firm, water-tight seal. Endorsed by Tour stars worldwide, the ECCO Golf collection is worn in competition by Fred Couples, Ernie Els, Graeme McDowell, Thomas Bjørn, Marcel Siem, Thongchai Jaidee, Will Wilcox, Na Yeon Choi, Caroline Masson, Jennifer Johnson, Sadena Parks, Kendall Dye, Line Vedel Hansen, Pernilla Lindberg, Therese Koelbaek, Sophie Giquel-Bettan, Liz Young, Sally Watson and Linda Wessberg, among others. ECCO, a world-leading brand of shoes combining style and comfort, has built its success on design and leather quality, and innovative technology. Founded in 1963, ECCO is one of the few major shoe manufacturers in the world that owns and manages every aspect of its leather and shoe productions and its retail sales. ECCO is also among the largest producers of high quality leather – customers include several of the world’s leading luxury brands. Today, ECCO Shoes and Accessories are sold in 88 countries at 3,060 ECCO shops and shop-in-shops, and at more than 14,000 sales points around the world. The company is family-owned and employs 19,800 people worldwide. ULike Creative, Inc. announces its Kickstarter crowd funding campaign for ti.ttle to launch on the 3rd of November, 2015, offering backers an exclusive opportunity to receive the device as a show of appreciation. ti.ttle is a new wearable golf training aid device that analyzes your practice swing and gives you a real-time feedback on the projected carry distance and various attributes of your shot. Before stepping up to strike the ball, you can try a few practice swings with ti.ttle mounted on your club and pick the best swing for the situation. With ti.ttle, golfers can also practice even without hitting a single ball, Golfers can tune their swing by looking at the results of each swing displayed on the ti.ttle swing analyzer. On the course, ti.ttle also functions as an e-caddie by pinpointing the remaining distance to the hole. ti.ttle is a small and powerful smart device that helps the golfers with their short game on the course and perfect their swing with every club by practicing consistent form anywhere and anytime. This feature is ideal for golfers who want to improve their technique but are unable to access a practice facility on a frequent or regular basis. ULike’s CEO JS Youn calls this device a ‘flight simulator’ for golfers. ti.ttle is a light and convenient device that comes with a wearable clip and cradles for mounting on each of the clubs. The OLED screen display on the device is equipped with a touch sensor for operation. Using a swing analysis algorithm, ti.ttle calculates the carry distance according to calibration with each club and adapts to provide incredibly personalized and accurate swing data. After a complete swing the carry distance is immediately displayed in real-time. ti.ttle has the ability to identify up to nine different swing types and uses a MEM (microelectromechanical) sensor to break down the swing, allowing the user to immediately adjust shot tendencies as practice continues. When on a course, ti.ttle pairs with the user’s smart phone to offer additional features. A decline call option and missed call management feature allow the player to remain focused on their game without distraction. By syncing with the smart phone’s GPS, ti.ttle also has access to Golf Course information for over 36,000 courses worldwide. While playing on one, the current hole number and remaining distance to the hole are displayed on the device. ti.ttle is the result of ULike’s CEO JS Youn’s passion for the golfing world that has spread among staff. ULike Creative, Inc is a technologies company specializing in smart wearable devices and mobile apps. The introduction of the device to a wider audience and raising funds for the initial production are the central objective of their campaign launch. Visit the Kickstarter Campaign Here. (LAWRENCE, Kan.) – Sports Turf Managers Association (STMA) – the professional association for 2,600 men and women who manage sports fields worldwide – and Minor League Baseball (MiLB) today announced the 2015 “Sports Turf Manager of the Year” award winners. Since 2000, STMA and MiLB have honored members who manage fields in Triple-A, Double-A, Single-A and Short Season or Rookie divisions. This year, three of the four honorees are multi-year winners, exemplifying a commitment to excellence and an unwavering dedication to maintaining world-class professional baseball playing surfaces. Phipps and Winter are both being honored for the third consecutive time (2013, 2014). Yearout is a second-time winner (2014) and Stewart is a first-time winner, joining an elite class of sports turf managers. Winners are selected via a 16-member awards committee, compiled by STMA. Each nominee is independently scored on cultural practices, game day routine, resource utilization, staff management and the groundskeeper’s involvement and support of the sports turf industry. STMA will present awards to recipients at the annual Major League Baseball Winter Meetings awards luncheon in Nashville, Tenn. on December 7. Winter is also presenting on “Turf Management Practices on High-Use / High-Wear Sports Fields” at the 2015 Athletic Business Conference & Expo on November 21 in New Orleans, La. For more information: www.stma.org, www.twitter.com/fieldexperts, 800.323.3875. STMA is the not-for-profit, professional association for men and women who manage sports fields worldwide. Since 1981, the association and its 34 local chapters have been providing education, information and sharing practical knowledge in the art and science of sports field management. Its more than 2,600 members oversee sports fields and facilities at schools, colleges and universities, parks and recreational facilities, and professional sports stadiums. 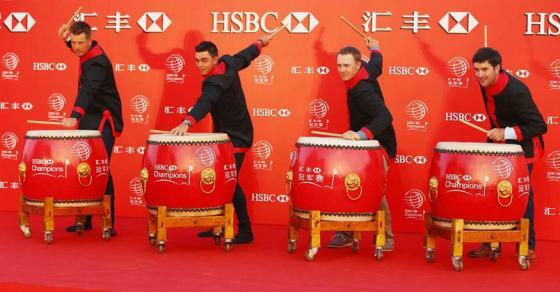 Four of the world’s top golfers today performed a traditional Chinese Lion dance to celebrate the launch of this year’s World Golf Championships-HSBC Champions – and a five year commitment to the tournament by the long-term sponsor. Current champion Bubba Watson was joined by World No 2 Jordan Spieth, World No 5 Rickie Fowler and World No 7 Henrik Stenson at the traditional rooftop celebration overlooking The Bund, Shanghai’s iconic riverfront. The players marked the start of the tournament by kicking off the drumbeat for a Lion dance, the traditional Chinese symbol of good luck, as the countdown to the tournament known as ‘Asia’s Major’ swung into action. For the third year running, the showdown at the Sheshan International Golf Club (Nov 5-8) has attracted close to 40 of the world’s top 50 players and sponsor HSBC has even more reason to celebrate after renewing its commitment to golf in China by agreeing a five year extension to its sponsorship of World Golf Championships-HSBC Champions. Giles Morgan, Global Head of Sponsorship and Events at HSBC, announced the sponsorship extension on stage at the 2015 Golf Business Forum, hosted in Shanghai. He said: “We have restated our commitment to golf in China by agreeing an extension for another five years. Over the last ten years, our flagship tournament has been a driving force behind the development of golf in Asia and with golf making a return to the Olympics at Rio 2016, we feel this is Asia’s major moment. “In addition to the World Golf Championships-HSBC Champions extension, we are also delighted to announce an extension of our other major flagship golf events, HSBC Women’s Champions and the Abu Dhabi HSBC Golf Championship whilst earlier this year we renewed our agreement as patron of The Open Championship. All in all, we believe this is a major statement of intent. The star-studded field also includes former World Golf Championships-HSBC Champions winners Dustin Johnson and Martin Kaymer, World Number 3 Rory McIlroy and top 20 players Louis Oosthuizen, Sergio Garcia and Adam Scott. The tournament boasts the toughest qualification criteria of all the World Golf Championships, with the majority of the field qualifying only by winning a key tournament on their Tours or by being ranked in the world’s top 50. (HARRIS, Mich.) – Sweden’s Dani Holmqvist – winner of the Island Resort Championship in June – was one of the top 10 finishers on the Symetra Tour’s “Volvik Race for the Card” money list this season and will play full-time on the LPGA Tour in 2016. The 2015 Symetra Tour schedule included 23 tournaments with stops in 12 U.S. states and a total purse of $2.73 million. Area non-profits that sold tickets to the tournament kept 100 percent of profits. In addition, Eagles for Charity, an extra donation program based on the number of eagles made throughout the tournament, raised $1,400 for the Wounded Warrior Project. The Island Resort Championship is also part of the Potawatomi Cup, which awards cash bonuses to players finishing in the top six of five Potawatomi Native American Indian-owned casino-resort tournaments. For more information visit www.sweetgrassgolfclub.com, or call 877-ISL-GREEN. Welcoming the world’s brightest new talent in women’s professional golf, the Island Resort Championship at Sweetgrass is a Symetra Tour – Road to the LPGA event held at Sweetgrass Golf Club in Michigan’s Upper Peninsula. The 54-hole stroke-play event was last held June 26-28, 2015. Located in Harris, Michigan, Sweetgrass Golf Club was designed by Michigander Paul Albanese and is situated at the Island Resort and Casino. Both course and resort are owned/operated by the Hannahville Indian Community of the Potawatomi Nation. The Symetra Tour – Road to the LPGA, is the official Qualifying Tour for the LPGA and just completed its 35th competitive season in 2015. With the continued support of its umbrella sponsor, Symetra, the Tour’s mission is to prepare the world’s best young women professional golfers for a successful career on the LPGA Tour. Top-10 money winners receive full, equal status for the following season on the LPGA Tour. Symetra Tour events have contributed more than $5 million to charitable organizations throughout the nation since 1989. DALLAS (Oct. 28, 2015) — Three Arcis Golf properties have been singled out as “Editors’ Picks” by WeddingWire as among the top country club wedding venues in the United States. The Arcis Golf properties are Arrowhead Golf Club in Littleton, Colo.; Canyon Springs Golf Club in San Antonio, Texas; and Tartan Fields Golf Club in Dublin, Ohio. WeddingWire—a leading global online marketplace connecting consumers with event and creative professionals—recently launched its Editors’ Picks program, which is designed to provide consumers with a peek at the venues and vendors that its editors believe are “the brightest stars” in the wedding industry. Only 20 country clubs were designated as Editors’ Picks. Arrowhead Golf Club. With Colorado rock formations and striking foothill views, Arrowhead offers one of the most stunning wedding settings in the country. The glass-enclosed Roxborough Room, which looks out on the Rocky Mountains, is the backdrop for indoor wedding ceremonies and receptions alike. The property’s Tent Pavilion, nestled against large red rocks, is ideal as an outdoor facility during the summer months. Canyon Springs Golf Club. There are four beautiful, unique wedding venues at Canyon Springs, including a dramatic outdoor space featuring a waterfall. The club is not only the perfect site for a wedding, but also excels at hosting rehearsal dinners, bridal parties, and a complimentary round of golf for the groom with discounted rates for his guests. Tartan Fields Golf Club. Featuring gorgeous views of its Arnold Palmer Signature Golf Course, Tartan Fields recently unveiled a new ballroom that can accommodate more than 200 guests and features an inlaid dance floor, as well as wall-to-wall windows. The Tartan Fields team provides complimentary planning and tasting meetings. For more information about Arcis Golf and its properties, visit www.arcisgolf.com. Arcis Golf, an operator of public and private golf courses and clubs under two distinct brands, is an industry leader, providing dynamic direction and unrivaled amenities that complement diverse playing experiences for members and guests. Arcis Golf properties tailor each element of the golf and country club experience to a level of excellence designed to exceed the needs and expectations of family, friends, co-workers, and guests of all ages. Castlegate operates exclusive private-club and resort-style properties with industry-leading standards of excellence, service, and upscale amenities. Ironbridge applies the same top-flight standards and practices to the management of private and daily-fee golf operations, ensuring the highest-quality playing experience and providing members and guests with unparalleled service. The Arcis Golf portfolio is supported by Arcis Equity Partners through strategic acquisitions that build and sustain the company’s leadership position in upscale golf and club experiences.